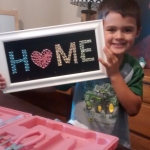 If there is ever any doubt as to whether you can homeschool your kids, let my story encourage you and remove any fears or hesitations you may have! Truly, if I can do it, so can you. Just a little over one year ago, my husband and I were starting to prepare to send our oldest child, our six year old son, to Kindergarten at our local public school. Sending him away to school wasn’t entirely new to us, as he had completed two years of preschool at the same school. So we already had our feet wet in the public school system. We attended the Kindergarten round-up, we knew who his teacher was going to be, what bus he would ride, and even had a large packet of worksheets to start working on with him over the summer to prep. To be honest, I wasn’t too excited of the thought of sending him to Kindergarten. I didn’t like the thought of our life being tied to the structures and schedules of the public school system. And even though I was public-schooled and loved it, I’ve also never been in its back pocket, so-to-speak. I had my concerns. So that’s where I was at. A lot of mixed feelings about sending him, but I really didn’t believe there was any other choice but to send him to public school. I was working part-time at the hospital in town as a Medical Lab Technician. My hours were all over the place, anywhere from 5 am to 9 pm, and then being on-call overnight and at the mercy of the ER. Homeschooling wasn’t even on my radar. July 2015, Independence Day. My husband had invited one of his previous coworkers and his family over to enjoy a day on the lake with us. The Weber family has two girls, their oldest being just a year older than our son. Naturally, in speaking with their mom, Rebecca, our conversation was a lot about our kids. I brought up the fact that my son would be starting Kindergarten in just a couple of months. Trying to glean some wisdom and encouragement from a mom who has just went through sending their first to school, I asked her how it went sending their daughter the first day. I was shocked! Let me be honest, it was a real eye-opener to me because they didn’t fit the “stereotype” of a homeschooling family. Their kids were friendly, talkative, confident, not “weird”, and Rebecca a very educated, former career woman. And, she wore makeup! I have never been against homeschooling, but somehow I had created a horribly inaccurate stereotype in my head about what types of people choose to homeschool. The Weber family didn’t seem to line up with my mental picture, not even the least bit. Now, please know I am embarrassed to admit that. It just goes to show how little I actually knew about homeschooling at the time. Needless to say, I was totally intrigued, and down the rabbit trail I went. I drilled that poor woman with every question about homeschooling I could think of. Lucky for me, she genuinely wanted to help me understand why homeschooling is an amazing option. I asked her about the homeschooling law in Minnesota, curriculums, time and scheduling your day, socialization, and on. The more we spoke, the more it felt like homeschooling was the right thing to do for our family. I was ready to jump in with both feet then and there. But, I had two big concerns; my job and my abilities. 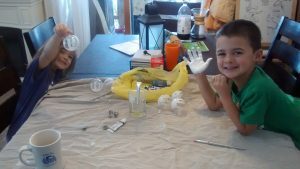 I didn’t foresee quitting my job for the sake of homeschooling. I carried the health insurance for myself and my kids. I had student loans to pay off. I just didn’t see homeschooling fitting with our family with me working. Thankfully, Rebecca was very encouraging and told me that I could “do” homeschool around my schedule. There is no rule saying it has to happen every day, Monday through Friday, eight to three. The joy of homeschooling is that school revolves around your family, not the other way around. My other main concern was I was asking myself, “Could I really do this, and do it well?” I have an education, a Biomedical Science degree, I got good grades in school (as if that really even matters), but I was still questioning whether I was good enough, smart enough, dedicated enough to teach my kids. Again, I was so encouraged by Rebecca. If the desire is there, the rest will fall into place. You are your child’s best teacher! By the end of the day with Rebecca, I was convinced. Homeschooling would be an amazing fit for our family, and it really could work, even with me working. However, I had no idea if my husband would be convinced, being he had been driving the boat all day and speaking with his friend. He probably didn’t hear any of the conversation. Homeschooling is flexibility. Homeschooling is teaching our kids the way they should go as a unique individual. 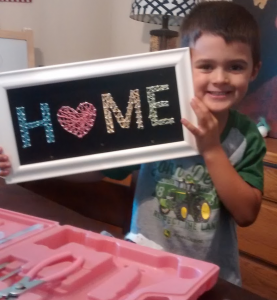 Homeschooling is allowing them to go deeper into the things they love, at their own pace. Homeschooling is freedom! Homeschooling is not merely replicating the public school system in the home setting, but it’s superior because you choose what, when, and how to teach based on what works for your unique family. I could definitely keep going on with or story, but I just wanted to give a brief look into what events drastically changed the course of our lives, for the better! And by sharing my story, it is my hope that I can encourage you that you are more than capable to make the same choice for your family! If your heart says homeschooling is right for you, each step you take in that direction will leave you that much more confident that you can do it, and do it well! Finding our way through the first year of homeschooling. Now I’m a year down the road. I’ve successfully finished Kindergarten with our son, and am just starting 1st grade with him and Kindergarten with our daughter. I look back and those initial feelings of self-doubt are still fresh in my mind, but they are also so far behind me. I know this is the best path for us, and am amazed daily how natural teaching and learning together are. 1. Reach out: to homeschooling friends and homeschooling support groups. They are there for you and want to help you! 3. Plan, but remain flexible: Set goals for your homeschool. What do you want to make it? You know your kids better than anyone else. Start with a goal and direction, but be flexible enough to waver from that if needed. 4. Pray: This should probably be listed first and last! I’m a strong believer that what God puts in your heart to do, he will help you through. And that starts by talking to Him about it. Please follow the rest of my journey on this blog! I am truly learning as I go, and have full confidence that you can and will too! Promise, you can! One of our first homeschooling projects for E’s Kindergarten year.